Before trolling through a 1910 edition of the Encyclopedia Britannica, I would not have been able to tell you what this scientific instrument was called. Now, I know that this is an armillary sphere drawing. 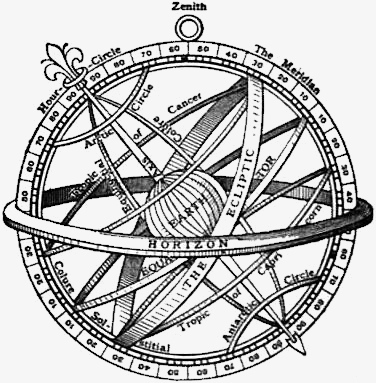 Armillary spheres are used in astronomy. The depict a model of objects in the sky. There are two kinds – Ptolemaic , earth-centered and Copernican, or sun-centered. Our armillary sphere drawing is an Earth-centered model. Armillarys originated in China. Ptolemy describes using a similar device. This armillary sphere drawing is identified as being an instrument from 1636. There’s a whole lot of science involved in how to use them. But, for our uses, it’s just a cool piece of scientific equipment.